Il grande Game Publisher Gameloft, che opera sul Market Android, ha dichiarato l’uscita di 10 nuovi titoli in occasione della partenza della commercializzazione del nuovo Sony Ericssone Xperia Play, il primo smartphone con tasti fisici dedicati al gioco. Infatti il cellulare-console verrà venduto con a bordo alcuni giochi preinstallati quali Asphalt 6 e Star Battalion. PARIS – Gameloft, a leading developer and publisher of digital, online and social games, is teaming up with Sony Ericsson to take the next step in immersive gaming on a smartphone with its newest stunning action/adventure thriller, BackStab, on Xperia PLAY. The game will be available exclusively on Xperia PLAY devices for one month, capitalizing on Xperia PLAY’s outstanding graphic capabilities and revolutionary controls. 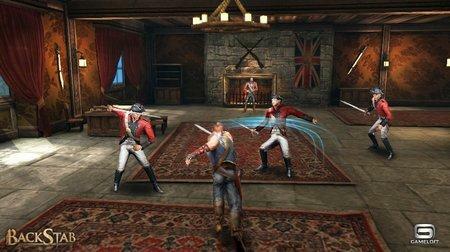 “We are delighted that Gameloft have chosen to launch this stunning new title first on Xperia PLAY. BackStab sets a high benchmark graphically and technically for gaming on a smartphone and it is a fantastic addition to the fast growing portfolio of quality releases for Xperia PLAY”, said Steve Walker, Head of Marketing for Sony Ericsson. 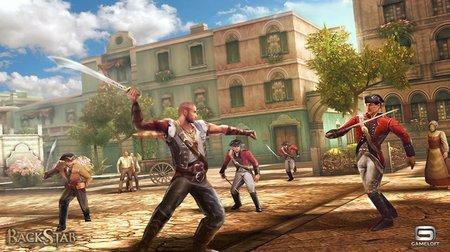 Set on an 18th century Caribbean island, BackStab is an epic story of revenge. Hero Henry Blake has been falsely accused of treason and will go to all means to seek vengeance on his British jailers. With a game play mixing action and adventure, BackStab incorporates an open 3D environment for free roaming. Coupled with dynamic combat systems and counter-attacks, missions include side quests and activities such as duels and races. Gameloft will have 10 games available at launch with two of those titles, Asphalt 6: Adrenaline and Star Battalion embedded on the device. BackStab will be available Q2 2011.